“There are two million men and women who depend on the golf industry to pay rent and put food on the table…“ – Hal Sutton, 2004 Ryder Cup Captain and 1983 PGA Champion. One question asked is always "what do we do with this report"? The most important first step is to read the information to fully understand the far-reaching impact that the sport of golf has on the local and state economy. The second step is to spread the word and make sure that your customers, members, community leaders, decision makers and legislators understand that golf is a real industry and deserves fair and equal treatment. Here are some suggestions on how to do that effectively. SHARE this web site with your members, customers, friends and family. CONTACT your local legislator and make sure they understand how important golf is to your community. Click here to find the name of the legislators in your town. According to We Are Golf, decisions are made each day that impact the golf industry. Here are few advocacy issues that you can talk to your community leaders and legislators about this summer. In Massachusetts, golf is a $2.7 billion industry, supports more than 25,500 million jobs and provides $796.8 million in annual wage income. 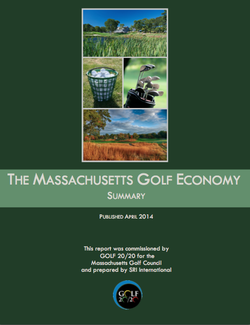 Of the nearly 376 golf courses in Massachusetts, nearly 70% are available to the public. The game is affordable – the median green fee nationally for 18 holes is $26. With more than 375 golf courses across state, the industry provides a significant amount of tax revenue at the local level and preserves precious open space. This reduces the tax burden on families and helps to maintain the value of homes in those same communities where golf courses operate. Our country has experienced several natural disasters in the last few years, causing incredible flooding and destruction to golf courses (Hurricane Katrina - 2005, Super Storm Sandy - 2012). Unfortunately, public courses have been grouped in with a select group of companies not eligible to receive disaster tax relief – which WE ARE GOLF is seeking to overturn on a national level. Golf is a key driver of charitable giving in Massachusetts – $74.3 million a year to be exact. Almost all of these philanthropic contributions go to causes outside of the sport. Beneficiaries include health, youth, education, environmental and cultural groups nationally, regionally and locally. According to a 2011 study conducted by the National Golf Foundation, golf as a fundraising vehicle includes an estimated 12,000 golf facilities (75 percent of U.S. total), 143,000 events, 12 million participants and an average of $26,300 per function. The golf industry is dedicated to continually improving the construction and management of environmentally-responsible and economically-viable golf courses. The goal is for course managers and developers to continuously improve water conservation, water quality protection, energy savings and pollution reduction. Golf courses provide ecological and economic benefits to local communities. They protect habitat for wildlife and plant species. The majority of facilities use natural resources efficiently, with less than 15 percent relying on municipal water supplies.